Why Does a Wildly Successful Young Woman Owe Anyone an Apology? 20-something wannabe novelists, cover your eyes and ears: Lena Dunham officially sold her self-help-y book proposal to Random House for $3.7 million dollars. Does she deserve it? Don't ask her to tell you that. Many will say (and have already said) that Dunham doesn't deserve such a massive amount of money. Those haters probably don't think she deserves her massive fame as an actor and director, either. Since I don't think anyone really "deserves" nearly $4 million bucks for writing anything, I'm more interested in hearing how Dunham herself will respond to her criticism; will she own her success, or will she demurely blow it off? Dunham spoke often about feeling compelled to say "sorry" during her talk at the New Yorker Festival yesterday: she said she struggled with how and whether to apologize for certain aspects of Girls ("It's not elegant or classy to go on Twitter and say I had to have summer jobs"), about her artistic choices (she's sick of people asking her why she always takes her clothes off), and about writing about real-life friends and ex-lovers who sometimes angrily confront her after the fact. She also said she worried about digging herself into a hole if her apologies weren't sufficiently apologetic. "I can't stand behind anything today," she laughed nervously after making a crack about people from New Jersey — and then instantly apologizing for possibly offending her audience. One of my friends said Dunham bugs her because she clearly knows what she's doing but acts like she doesn't. "Why can't she just be a strong, powerful woman?" she asked me. "There's nothing wrong with that." Of course there isn't. But I can't think of any young, successful women on par with Dunham who unapologetically own their fame and fortune without getting an intense amount of criticism for doing so. Can you? Older people get away with owning their success and making controversial artistic decisions because people usually agree that they've earned it. Lena is often compared to Larry David and Louis C.K., two celebrities who are unrepentant about being assholes onstage and on the TV screen — but that's not only because they're men, it's because they've worked as actors and writers for decades. But young, successful men get away with being cocky in a way that young, successful women do not. They might get flack for being full of themselves, but in a "boys will be boys" sort of way — like Jonathan Safran Foer, or pre-plagiarizing Jonah Lehrer. Young famous women, on the other hand, have two choices: they can appear spoiled and ungrateful, or apologetic and "aw, shucks"-like. 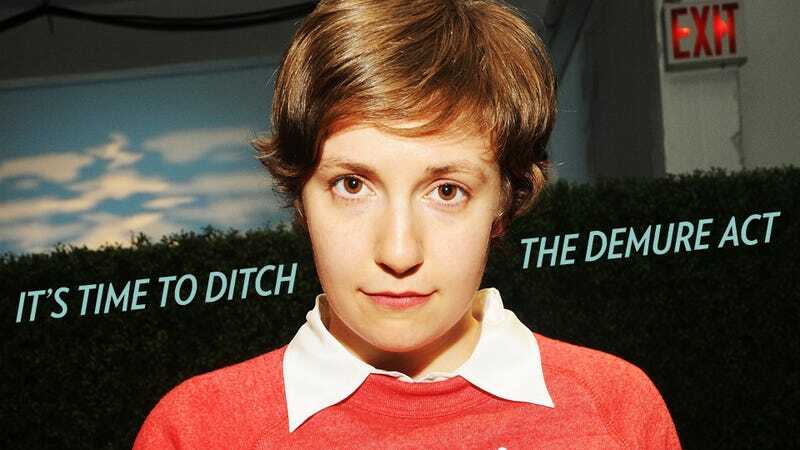 The savvier ones, like Dunham, often go with the latter. Women — particularly young women — are supposed to be respectful. They're supposed to make Taylor Swift faces when they win awards. There's a reason why you can't spell "cocky" without the first four letters. In a statement today, Dunham said that she was "thrilled to be working with and learning from the brilliant minds at Random House, and to be among their incredible roster of authors. I look forward to digging deep with Andy and co. to produce the most thoughtful and personal book I can." Every aspect of that statement attributes her deal to someone else, or implies that she'll need help to get the job done. But how else could she have possibly responded? Yesterday, Dunham mentioned that she loves self-help books because she's fascinated by how "certain people think they're qualified to give self-help." That self-disparaging quote elicited laughter, but Dunham clearly thinks she's qualified — and Random House does, too. I don't blame her for being wary about showing it.